We are members of the community who have formed a non-profit organization dedicated to providing SUPPORT and EDUCATION regarding issues related to dementia. We have dedicated volunteers that facilitate SUPPORT GROUPS and ROUND TABLE DISCUSSIONS, which allow attendees to discuss issues they face, learn new coping skills and help others while helping themselves. 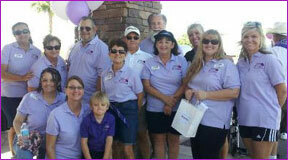 Watch for details about our annual Movin' For Memory Walk in November! first, second and third Tuesdays of each month at 1:00 pm. An activity group is provided for your loved one, if you are interested please call 928-453-8190 to make a reservation for the activity group. Tuesday meetings are held in the HCHF Learning Center in the Shambles, 2126 McCulloch Blvd. N. Ste. 5 & 7. 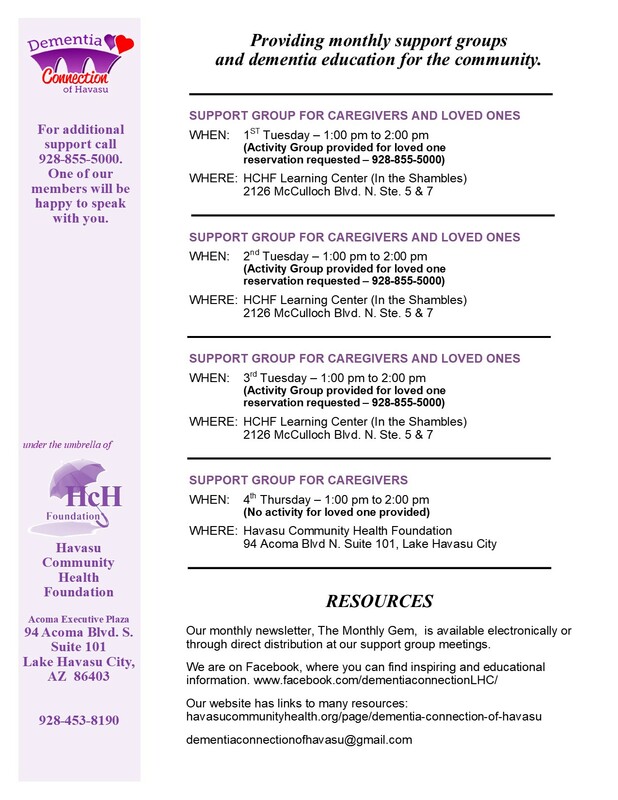 On the fourth Thursday of the month at 1:00 pm, there is another meeting for caregivers or family members only..
Thursday meetings are held at HCHF meeting room at 94 Acoma Blvd. S. Suite 101. Click here to download the schedule for the support groups. • Dementia is a general term that describes a group of symptoms-such as loss of memory, judgment, language, complex motor skills, and other intellectual function-caused by the permanent damage or death of the brain’s nerve cells, or neurons. • One or more of several diseases, including Alzheimer’s disease, can cause dementia. • Alzheimer’s disease is the most common cause of dementia in persons over the age of 65. It represents about 60 percent of all dementias. • The other most common causes of dementia are vascular dementia, caused by stroke or blockage of blood supply, and dementia with Lewy bodies. Other types include alcohol dementia, caused by sustained use of alcohol; trauma dementia, caused by head injury; and a rare form of dementia, frontotemporal dementia. • The clinical symptoms and the progression of dementia vary, depending on the type of disease causing it, and the location and number of damaged brain cells. Some types progress slowly over years, while others may result in sudden loss of intellectual function. • Each type of dementia is characterized by different pathologic, or structural, changes in the brain, such as an accumulation of abnormal plaques and tangles in individuals with Alzheimer’s disease, and abnormal tau protein in individuals with frontotemporal dementia. Although every case of Alzheimer’s disease is different, experts have identified common warning signs of the brain disease. Remember, Alzheimer’s disease is not a normal part of aging, and it is important to look for signs that might indicate Alzheimer’s disease versus basic forgetfulness or other conditions. With Alzheimer’s disease, these symptoms gradually increase and become more persistent. If someone is exhibiting these symptoms, the person should check out his or her concerns with a healthcare professional. Awareness of these warning signs is not a substitute for a consultation with a primary care provider or other qualified healthcare professional. • Difficulty with complex mental assignments, such as balancing a checkbook or other tasks involving numbers. • Clinicians can now diagnose Alzheimer’s disease with up to 90 percent accuracy. But it can only be confirmed by an autopsy, during which pathologists look for the disease’s characteristic plaques and tangles in brain tissue. • Clinicians can diagnose “probable” Alzheimer’s disease by taking a complete medical history and conducting lab tests, a physical exam, brain scans and neuro-psychological tests that gauge memory, attention, language skills and problem-solving abilities. • Proper diagnosis is critical since there are dozens of other causes of memory problems. Some memory problems can be readily treated, such as those caused by vitamin deficiencies or thyroid problems. Other memory problems might result from causes that are not currently reversible, such as Alzheimer’s disease. • The sooner an accurate diagnosis of “probable” Alzheimer’s disease is made, the easier it is to manage symptoms and plan for the future. Click here to gain insight into the new diagnostic guidelines for Alzheimer’s disease released in April 2011, as discussed by Marie A. Bernard, M.D., deputy director of the National Institute on Aging and one of the experts who helped develop the criteria. Click here to learn more about community memory screenings, including those provided during AFA’s National Memory Screening Day each November and Community Memory Screenings year-round. Results of screenings during these initiatives do not represent a diagnosis, but can indicate whether someone should pursue a full medical examination. 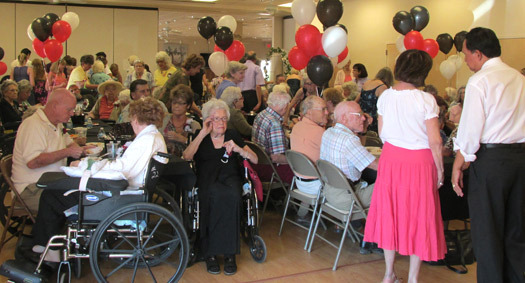 We at the Alzheimer’s/Dementia Connection of Havasu provide free memory screening. Just email or call us at 928.855.6000 to set your appointment. Assessing what you and your loved one may need can be overwhelming. You can attempt this on your own, or you can hire a geriatric care manager who will conduct a formal assessment, which will identify both needs and sources of assistance. Learn more on how to properly assess your and your loved one’s needs. Find out what community services are available where your parents live, or get help from a geriatric care manager, social worker or hospital discharge planner. These folks can point you in the right direction for the services you’re interested in. In addition, some community agencies provide relevant information and referral services. What will insurance cover? While you may be able to find free or subsidized services, some may be short-term only. If Medicare, Medicaid or other insurance policies provide coverage, be sure to find out the limits. Check with your area agency on aging, organizations offering community or faith-based services, and your local department of social services. There is limited government oversight of long-term care services, so it’s important for you to analyze their quality. If someone is coming into the home, interview them, check with the agency that represents them (if applicable), get referrals and ask for references. If you are bringing your loved one to a facility, take a tour, interview staff, ask to contact other families who are using/have used the facility in the past and take notes about anything amiss. Start with friends and family. Interview providers and involve your parents if feasible. Find out about worker education, training and experience, and get at least two references. Ask if the agency screens and bonds employees and provides training. Visit facilities. How clean are they? What kinds of activities are going on? Who participates — those with physical disabilities? Speech problems? Alzheimer’s? Specialists on aging will tell you to organize a filing system for all the agencies you research. This will come in handy should you need to compare and contrast all of the different agencies and services you look into. Although your loved one may prefer that you or other family members provide all their care, you have the right to get help. Work through their concerns, and if needed, seek help from a geriatric care manager. While it’s their best interest that you have at heart, you need to remember to take care of yourself. The authors know how incredibly difficult it is to watch a loved one lose herself. They describe their mother’s struggle with Alzheimer’s disease from the first signs of illness until the day they lose her for the second time. Still Alice is a compelling debut novel about a 50-year-old woman’s sudden descent into early onset Alzheimer’s disease. Offers a glimpse into the world of individuals living with Alzheimer’s disease. The author, who was diagnosed at age 58, shares his account of his slow transformation and deterioration. Losing Lou-Ann is a biography of a Pick’s disease patient from diagnosis to death, seven years later. Offers a practical approach to the emotional well-being of both patients and caregivers. by Robert N. Butler, M.D. The Vial of Life is a smart way to have your medical information on hand just in case of an emergency. Seniors need this because of their constant medical changes and medications… It’s the right thing to do. AZ Care Check is a searchable database containing information about deficiencies found against facilities/providers by the Arizona Department of Health Services. Records may be searched by facility/provider name, location, and provider type. The database contains information about the facilities and providers. Specific searches for Enforcement Actions can also be conducted by selecting that option.